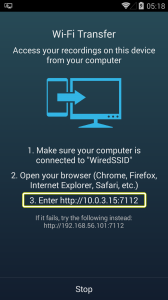 Wi-Fi Transfer allows you to access your recordings on your device from your computer. There are two methods to perform Wi-Fi Transfer. Firstly, make sure your device and your computer are connected to the same Wi-Fi connection. The second method to perform Wi-Fi Transfer is by connecting your PC to access point (tethering) of your device. 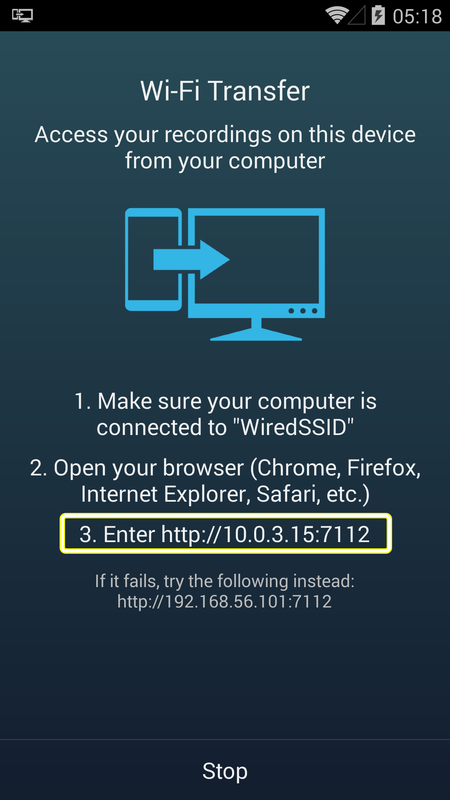 Tethering allows connecting your device with your computer. Take note that Wi-Fi Transfer will only display recordings on the location of stored recordings. You can change the locations in app Settings, then select Recording, and choose your preferred location of stored recordings. Should you need further assistance, please do not hesitate to contact us! Hi-Q MP3 Voice Recorder has a feature to set recording input gain. 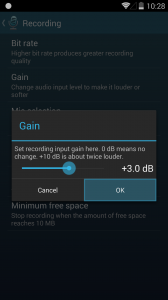 By changing your audio input level, you will be able to record at different places and surroundings. For example, you want to record sermon at church, which is quiet. Increasing the input gain will amplify the sound, so you can hear the sound clearer. That is to say, a gain greater than one (zero dB) means amplification; while a gain lesser than one means to reduce the sound level. Most of the time you don’t need to adjust this. 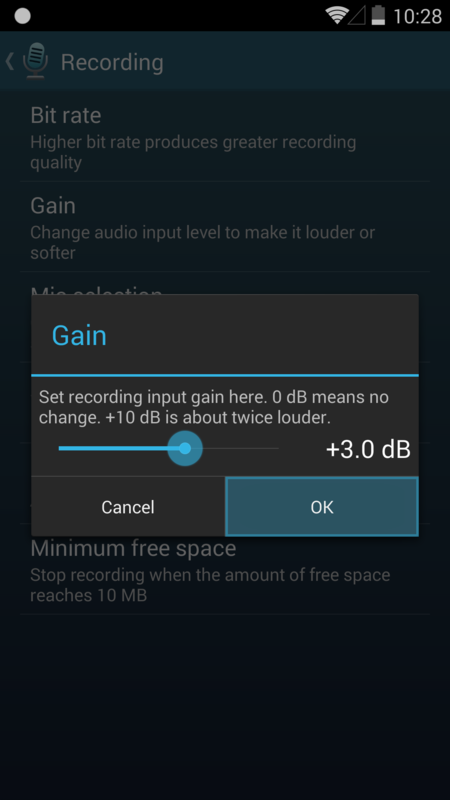 To adjust recording input gain, open the in-app Settings, then select Recording, and adjust Gain. 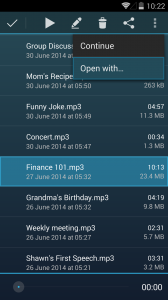 You can open your recordings with any MP3 player installed on your device. 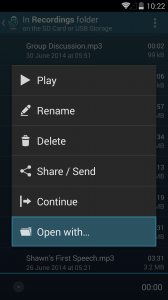 For example, you want to play your recordings on the Sound Player or Google Play Music installed on your phone. Three ways to access your recordings to MP3 player. 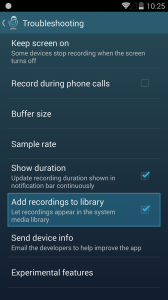 Firstly, make sure you add recordings to library (enabled by default) from in-app Settings, and select Troubleshooting. Once you let your recordings appear in the system media library, you will be able to open your recordings with any MP3 player. Secondly, even without adding recordings to library from in app Settings, you can tap the recording name from your recording list, a pop up dialog will appear and the last menu is Open with. Select Open with and you can choose any MP3 player available. Lastly, long press the recording you want to play on the recording list, you can select the overflow menu on the top right corner of your screen. Select Open with, and the list of MP3 players will appear. Thanks to Hi-Q MP3 Voice Recorder users who gave their feedbacks and comments, we recently updated Hi-Q MP3 Voice Recorder to a new one. We added Auto-start feature that allows you to start recording as soon as the app is launched. For example, if in the past you regularly record sermons or talks, and you mainly open Hi-Q MP3 Voice Recorder and press record button just to start recording, with Auto-start, we made a faster access to start recording! You can activate Auto-start from in app setting. Once Auto-start is activated, when you start Hi-Q MP3 Voice Recorder from the apps list or from your Home screen, it will start recording. You can also use some applications like Tasker or AutoPebble. 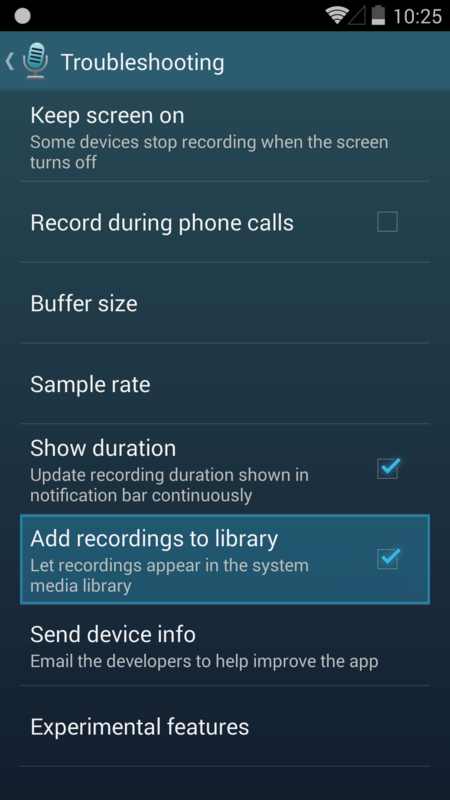 This allow you to start Hi-Q MP3 Voice recorder when certain conditions are met, so you can automate recordings. 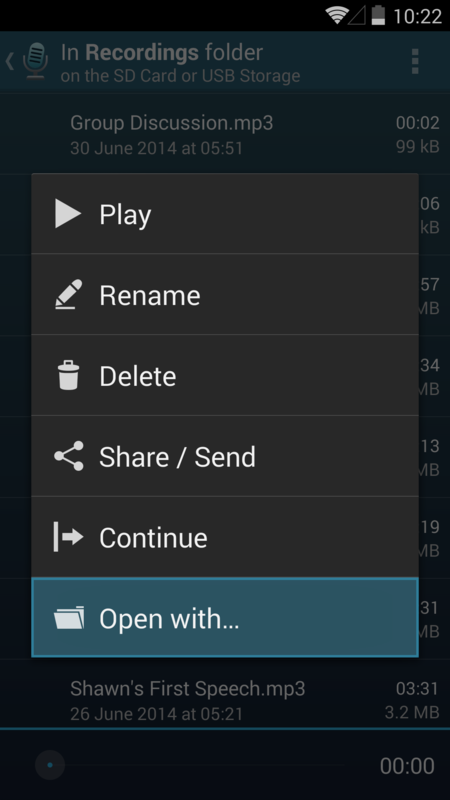 For example, we want to automate recording when we open Notes on our phone. We can set up Notes as our condition, and start Hi-Q MP3 Voice Recorder as the action. 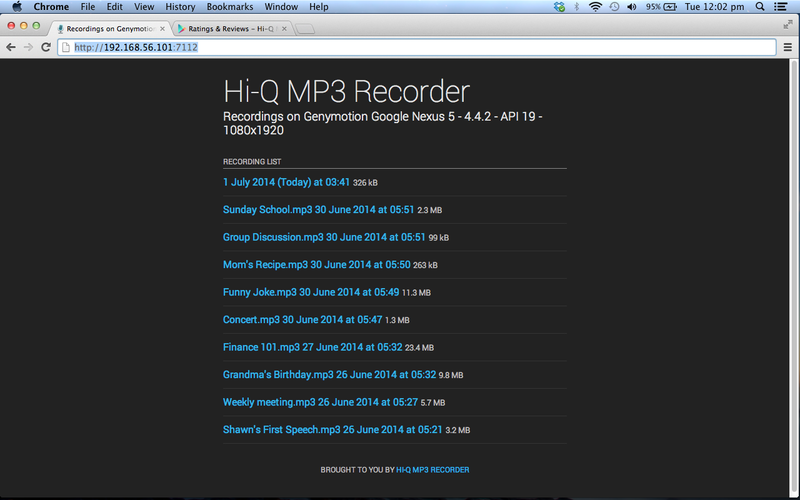 As soon as you launch Notes on your phone, Hi-Q MP3 Voice Recorder follows. Other utilities, like Pressy, let you perform Hi-Q MP3 Voice Recorder at a single touch of its physical button. Or even Android Wear, allows you to start Hi-Q MP3 Voice Recorder, and now you can record with those commands. Hope that Auto-start feature will be useful for you. If you need further assistance, please do not hesitate to contact us! 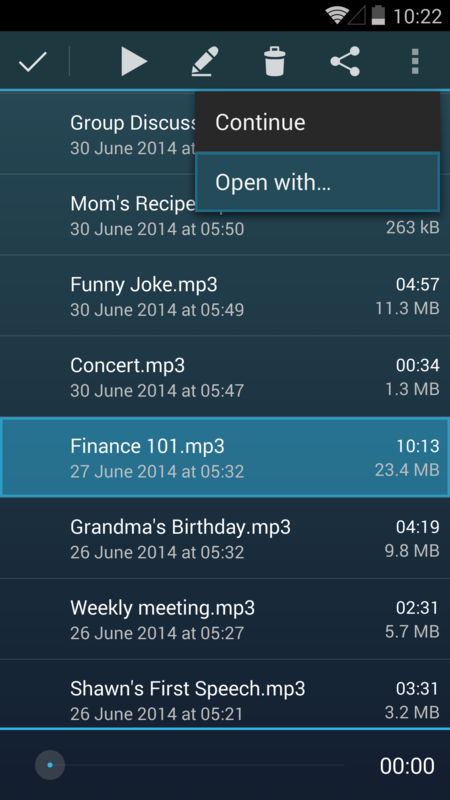 We are glad to announce Hi-Q MP3 Voice Recorder new version Beta 1.20.0. This version will only available for beta tester. To join the beta testing group, please click here. After joining, click here while logged in to Google Play, and you will be able to download Beta versions of Hi-Q MP3 Voice Recorder from your phone. Should you require more assistance, please do not hesitate to contact us! 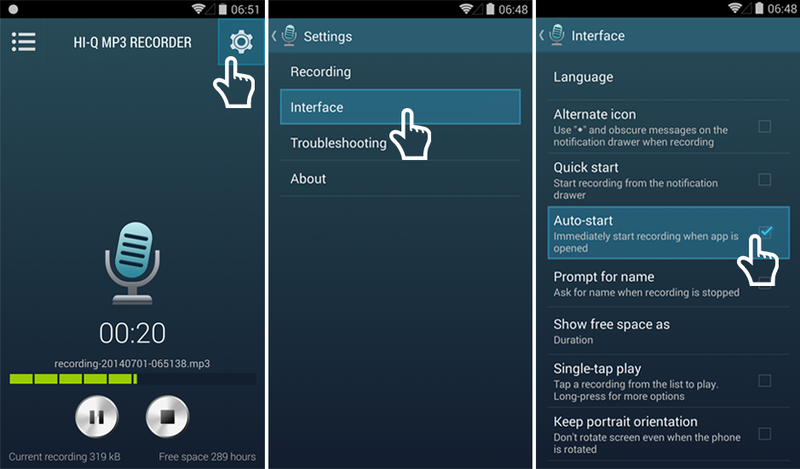 We are glad to announce that Hi-Q MP3 Voice Recorder newest version allow you to record as soon as you launch the app. 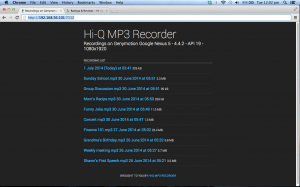 Re-launch Hi-Q MP3 Voice Recorder and start recording in a flash! If you have not downloaded Hi-Q MP3 Voice Recorder yet, please click here. Should you need further assistance, please do not hesitate to contact us! This post will explain how to use Hi-Q MP3 Voice Recorder one of the main features, Wi-Fi Transfer. 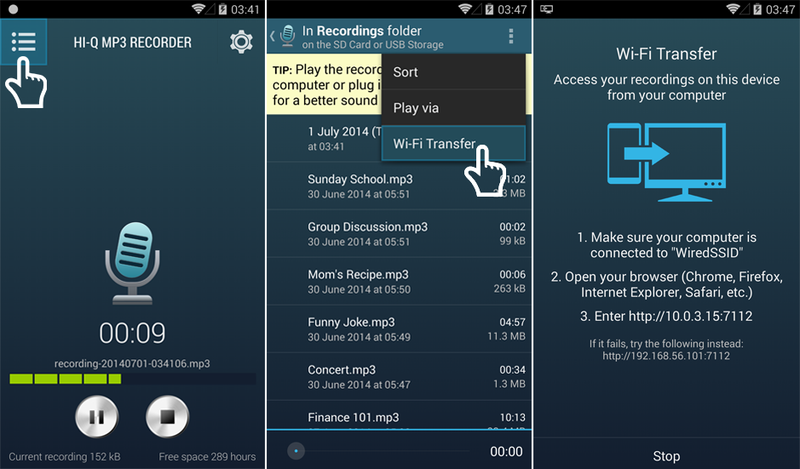 Wi-Fi Transfer allows you to access your recordings on your device from your computer. Hope this information helps! Should you need further assistance, please do not hesitate to contact us.